Elementary Latin I is an intensive course designed to introduce you to the basic elements of the Latin language. 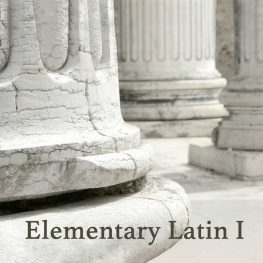 Elementary Latin I is an intensive course designed to introduce you to the basic elements of the Latin language. It will emphasize the fundamentals of grammar, vocabulary, and reading comprehension – in other words, all of the tools necessary to develop a sound reading proficiency in Latin. This class features pre-recorded lectures from Dr. Philip Walsh. Credit students will also attend live one-hour preceptor sessions twice per week. Students will be expected to watch the assigned lectures (about 45 minutes each) before each preceptor session. The time of these sessions will be determined when the scheduling needs of the students are known. There will be 2 one-hour prerecorded lectures per week, with two weekly discussion sessions as assigned. During the semester students will work through Wheelock chapters 1-21.